Disclosure: This post is sponsored by El Monterey, but the content and opinions expressed here are my own. Mornings can be very hectic in our house. I have 3 kids and they have two completely different school schedules. My first round (the younger son and daughter) have to be at school no later than 7:30 a.m. Lucky for me we live very close to the school, so they get to sleep until about 6:30 or so, to ensure less grumpy kids. Unlucky for me, that means we are rushing around in the morning and the easiest thing for them to eat was a bowl full of cereal. There were usually no hot breakfast for my kids on weekday mornings, but now that’s changed. 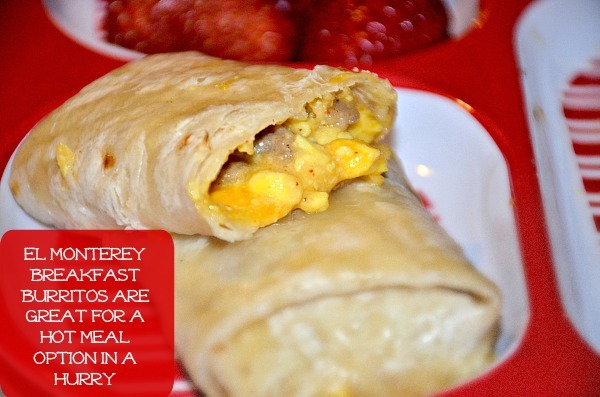 This #MomWins with El Monterey Signature Breakfast Burritos. Why El Monterey Breakfast Burritos? 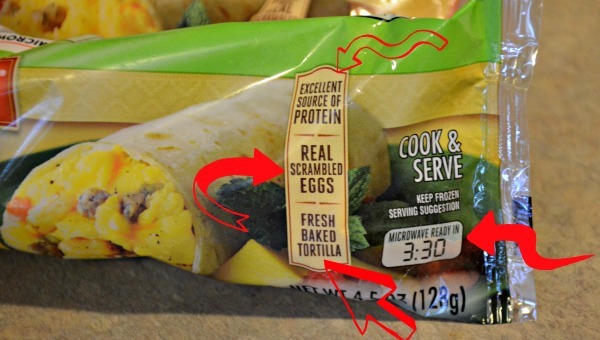 They are an excellent source of protein, have real scrambled eggs, and a fresh baked tortilla. As if those are not reason enough, they are ready in 3 minutes and 3 seconds, which means my kids get a hot breakfast even on those rushed mornings. They are available in five flavors and three different sizes, including single-serve, 4-count and 12-count. 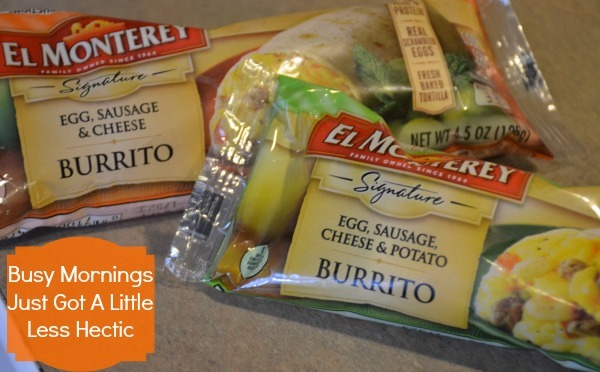 Our local store had the single packs of the El Monterey egg, sausage, cheese and potato burrito, as well as the El Monterey sausage, egg, and cheese burrito. So, I picked up a few of both so we could try them out. I have to say we LOVED them, they were tasty, soft, rich, and really everything a breakfast burrito should be. Because they were such a hit, I am going to be looking for the 12 pack! Plus I can use this $1.00 off coupon when purchasing that multi-pack! I loved that they were individual, at our local retailer, because we could try several flavors to see which ones we liked the most. Seeing as we really enjoyed the two we tried, we will definitely get multi-packs in the future. The cool thing is, even in the multi-packs, each burrito is wrapped individually. Which means you don’t have worry about how fast you need to eat them once you’ve opened the box. A delicious, hot breakfast, that’s ready in a snap AND that my picky eaters LOVE. I’d say that’s definitely a #MomWins moment! Visit El Monterey for more information on their products. And don’t forget to download your $1 off Coupon. Check out El Monterey on Facebook, Twitter, and Pinterest. What are some of your time saving tips for busy mornings? These look delicious! I’d love to try the Egg and Bacon Breakfast Burrito. I haven’t tried this brand before. I’ll check it out next time I’m at the store. Thanks for sharing!